That’s right—we’ve found stylish, high-quality prefabs that start at $135,000. When it comes to home construction, prefabricated homes can be more expensive than traditional homes—particularly when they’re one-offs as opposed to mass-produced. This can be due to a range of reasons, from near-complete customization to a client’s desires to the high cost of manufacturing in the United States and the enormous factories required to build large elements—and that's before even considering the cost to acquire the site. 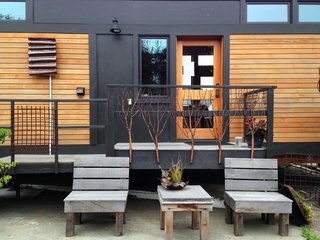 However, not all prefab homes have a large price tag, and we’ve rounded up six of our favorites that can be purchased for under $250,000 here (note that costs including site acquisition and connection to local water and electrical sources are not included). "Our favorite room of the new FUSE might be the one that's outside… the large covered porch! A close second could be the laundry/mud room—a whole room devoted to making things clean! The rest of the house is always a favorite—wide open kitchen/living spaces complete with a large island, perfect for gathering and just being. Bedrooms are on opposite ends of the house, each with access to spacious baths that feature full tile showers along with the typical Ideabox array of finishes." "Our most popular model. The open breezeway makes way for space between living/dining/kitchen area and bedrooms. A wall of glass doors in the living room gives way to the stars." "If you've been wishing for some added living space, we're cooking up the perfect solution for you! BrightBuilt Barn is a nod to both Maine's historically agrarian landscape and to the potential of modern innovation, in a tidy, little barn structure. 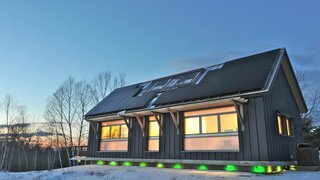 Features of Brightbuilt Barn include zero energy bills because of super warm, heavy insulation, solar power from solar panels, and low-maintenance materials. The home is power-outage-proof and can be moved to another site at a later date!" "This single-story design consists of a combined kitchen/living/dining space, one bedroom, and one full bath. 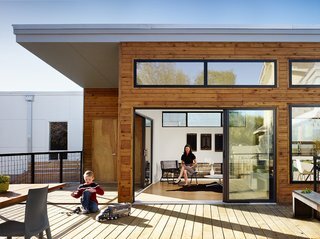 Amenities include covered entry porch and passive house design. Our patented frost-protected shallow concrete foundation delivers Passive House-level energy efficiency while minimizing site disturbance and construction cost. We polish and seal the surface to create an attractive, low-maintenance floor that stores heat for a stable indoor temperature and a warm feeling underfoot." 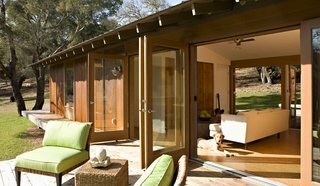 From Greenpod: "Our WaterHaus designs are the first homes to offer sustainable, healthy interiors. Designer Ann Raab utilizes movable walls, natural and cost-efficient lighting, and interior glass to visually enlarge living spaces, while reducing the home’s environmental footprint to only 450 square feet that contain everything you need. 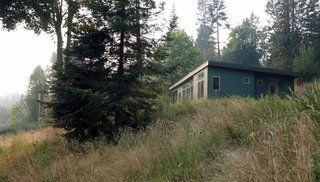 Our smallest Seattle modular homes design complies with city codes for affordable dwelling units and offers barrier-free designs for wheelchair access. All of our efficient homes can be upgraded in size to complement your needs and your site. We maximize solar gain and view while creating privacy. Customized homes are designed with your budget in mind with complete menu and a la carte options." From Hom Lifestyle: "Borrowing from both modern sensibility and local vernacular, the HOM dwelling series has iconic form, thoughtful layout. and optional finishes. Friends and family gather in the 'heart' of each home—the indoor/outdoor central space lined by full-pane wood doors along the length of opposite walls. To each side of the center are the bedroom and bath suites, which comfortably accommodate a variety of private retreat. The HOM layout is paramount to the idea of living with nature—in style."